By rail, the city of Khabarovsk in the Russian Far East is a six-day, 5,300 mile journey from Moscow. Given the distance, it’s unsurprising that most visitors prefer to make the trip by air. The nine-hour flight has the added advantage of giving travelers a dramatic overview of the Amur River on the approach. Indeed, Khabarovsk is a city of two great strategic rivers: the Amur, which flows eastward along the border with China; and the Ussuri, which flows northward some 560 miles from its origins in the southern Sikhote-Alin Mountains, not far from the Sea of Japan. The confluence of these two rivers near Khabarovsk, and the state boundaries they define have created one of the most important geopolitical zones in northern Asia. Russian explorers attempted to gain control of the north bank of the Amur as early as the 1640s, but Russia was compelled to abandon the area by the Treaty of Nerchinsk, signed in 1689. Russian troops did not return to the region in substantial numbers until the mid-19th century, under the leadership of Governor-General Nikolai Muravyov. He was later given the title “Amursky” for his role in acquiring the territory for the Russian empire. In the Treaty of Aigun (1858), negotiated with the Qing Dynasty, China ceded to Russia territory north of the Amur and east of the Ussuri. Khabarovsk arose as a consequence of the Treaty of Aigun. The first Russian settlement was established in May 1858 by a detachment of Siberian troops under the command of Captain Yakov Dyachenko. The post was initially named Khabarovka in homage to the renowned 17th-century Cossack leader Yerofei Khabarov, who explored the area. The settlement rapidly expanded, and by 1864 it already had a formal plan for development on hilly terrain along the left bank of the Amur. 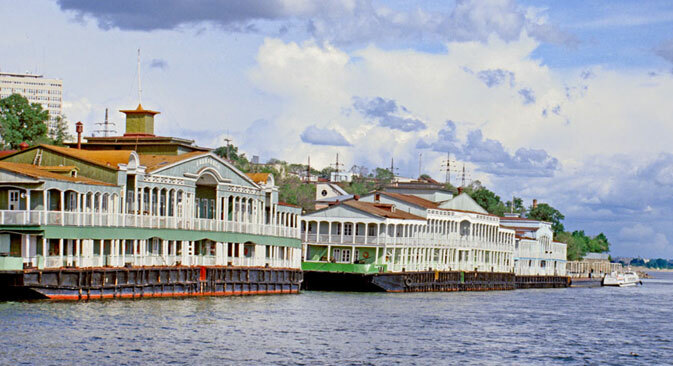 A telegraph line to Vladivostok began operating in 1868, and a proper river port was completed in 1874. By the end of 1880, Khabarovsk had gained over 4,000 inhabitants and an official status as a town. To get to Khabarovsk from Moscow of St. Petersburg take a regular flight. The trip takes approximately 7,5 hours. Entrepreneurs looking to capitalize on the development of river trading routes were quick to settle in the young town, which offered considerable potential for commerce with China. Progress in transportation also led to increased government authority. In 1884, Khabarovsk became the administrative center of a vast area stretching from the Amur River to the Pacific. The town’s status was further enhanced in late May 1891 when the heir to the throne, Tsarevich Nicholas Alexandrovich (subsequently Nicholas II) included Khabarovka on the itinerary of his nine-month-long world tour. At the time of his visit, the town unveiled a heroic monument to Muravyov-Amursky by the noted sculptor Alexander Opekushin. Dismantled during the Soviet period, the monument has since been restored to a prominent position overlooking the river. In 1893, the town’s name was changed from Khabarovka to the more formal Khabarovsk. Perhaps the greatest catalyst for the town’s early growth was the completion of a rail line from Vladivostok in 1897. Khabarovsk now had a direct link to a growing international port, even as it controlled interior river traffic over the extensive territory of the Amur River basin. The town’s strategic location was not lost on military planners, who developed local machine factories to equip the armed forces of the Far East. At the same time, Khabarovsk, like the rest of Russia, experienced severe labor and military unrest in 1905-06 following the country’s defeat in the Russo-Japanese War. With the return to stability under Prime Minister Pyotr Stolypin (1862-1911), Khabarovsk continued its rapid growth. During the three decades from 1884 to the beginning of World War I, the population increased more than 10-fold. And in 1908, Khabarovsk became the headquarters of the Amur River Flotilla, with responsibility for patrolling the long frontier with Manchuria. In 1914, connections were improved with the Trans-Siberian Railway, which gave Khabarovsk access to distant Moscow and St. Petersburg. At that time, however, the rail route to the Russian Far East still went through Manchuria along the Chinese Eastern Railway. The town was linked directly to eastern Siberia only in 1916, with the completion of a bridge across the Amur just to the northwest of Khabarovsk. Built in difficult conditions within three years, the bridge was one of the major achievements of Russian engineering. To this day the attractive, often imposing architecture of central Khabarovsk reflects the prosperity of the town at the turn of the 20th century. Using an eclectic mixture of neoclassicism and medieval Russian elements, architects designed enduring, well-built structures for housing, commerce and administration. A peculiar local feature was the use of high quality, unstuccoed red brick for the structure, with gray brick for decorative trim. The most visible indicator of prosperity and rising consumer demand was the large department store. Firms such as Kunst and Albers, which had stores in several towns, and the Pyankov Brothers used architecture to create an impressive display for retail trade. The large Plyusnin building, subsequently converted to the Regional Library, contained one of the town’s many banks. The best of these buildings are on the main street, which is named after Muravyov-Amursky. Other historic buildings display the style moderne that was fashionable at the beginning of the 20th century, with traces of traditional Russian decoration. The best example is the former building of the city council, now carefully restored. The devastation of World War I occurred far from Khabarovsk, and the city actually grew with expanding military production. But the civil war following the Bolshevik Revolution caused major damage and disruption. The last major battles of the Civil War occurred near Khabarovsk. Red partisan forces recaptured the town in early 1920, but they were suddenly attacked by the Japanese in April. Fierce fighting led to significant destruction in the central district. Instability continued until December 1921, when the city was retaken by a White army led by Viktorin Molchanov. At the battle of Volochaevka in February 1922, Molchanov’s defenses were breached and Khabarovsk was retaken by Red forces, but not without further damage to the area, including partial demolition of the magnificent Amur River Bridge. Authority was vested in the Far Eastern Republic, a Communist ally that formally merged with the new Soviet state in November 1922. During the Soviet period, the expansion of Khabarovsk accelerated thanks to its strategic military, industrial and administrative position. The pace of growth is reflected in modernist buildings designed by prominent Constructivist architects such as Ilya Golosov, who built the large complex for the House of Soviets in 1929-30. In the 1930s the Gulag concentration camp empire expanded and prison labor was used in construction. A number of building projects in Khabarovsk were undertaken by the NKVD, which preferred a pompous neoclassical style. Relics of that time include the GlavDalStroi Building and the Commune House, all on Muravyov-Amursky Street. Greatly expanded after the war, Khabarovsk maintained its momentum into the post-Soviet period. The city’s vitality is reflected in the improved appearance of Muravyov-Amursky Street, from a renovated Lenin Square to Cathedral Square, with its new Dormition Cathedral visible from the Amur. In 2004 the Transfiguration Cathedral was consecrated on Glory Square near the river. With a population of just over 600,000, Khabarovsk has witnessed a building spree of contemporary apartment houses in colorful post-modernist forms. And the city’s good management was acknowledged in 2000 when it was chosen as the headquarters of the Far Eastern Federal District. In the late summer of 2013 the Khabarovsk area experienced a record-setting flood of the Amur, but the main part of the city — on high ground — avoided the worst of the destruction. Among the city's promising economic developments is its pivotal role in the massive "Strength of Siberia" gas pipeline project, which will link the gas fields of Yakutia to the rapidly expanding Chinese market. With its well-maintained central district, Khabarovsk preserves its heritage as it looks to the future.